Are you drawn to all-white rooms? When Country Living’s new book Decorating with White arrived on my doorstep, I immediately sat down to ooh and ahh at all the lovely photos in it, including this one of a rustic kitchen in a renovated barn. The book says, “A room painted white provides light, tranquility, and a sense of spaciousness.” I agree. We painted all the rooms in our first house white and loved it. We had high ceilings and large windows and the white looked great. The rooms felt big and bright and happy. It was easy to decorate those white rooms, too. Photos by Lara Robby and Bjorn Wallander. When we moved into our current house, we found that white walls didn’t work as well. We’re on a heavily wooded lot, which means some of our rooms feel dark even in the middle of a sunny afternoon. The light we get here is different than we had in our first house, and white walls made the rooms feel cold. Bolder and warmer colors seem to work better in the “shadiest” rooms of our house that don’t get a lot of natural light. My bedroom, for example, which I never liked when it was white but now love in a deep teal. It seems counter-intuitive to paint darker rooms with darker colors, but somehow it works. Has anyone else found that to be true? Some days I really miss that light and sunny house we used to have with all the white walls and beamed ceilings. I’d love to live in one like that again. The only white walls we have here are in our sunroom–my favorite room in the house. Bedroom photo by Bjorn Wallander. Photo at top of post by Robin Stubbert. 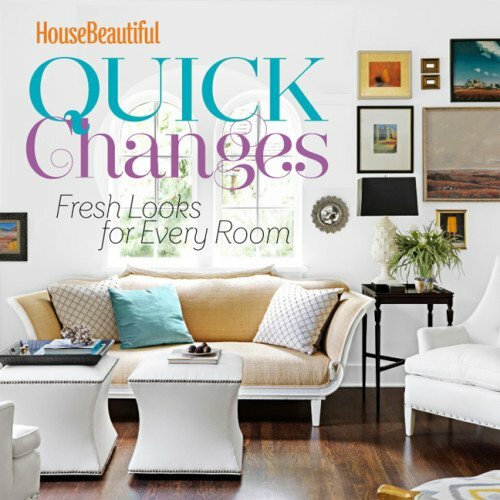 Another decorating book I was recently sent a review copy of that I enjoyed was House Beautiful Quick Changes: Fresh Looks for Every Room. It’s only about as big as that photo of the cover above, which surprised me when it arrived. It may be small, but it’s filled with great tips for perking up your place. I love decorating books. Have you read any good ones lately? I love this! Especially the kitchen with the old “icebox”. Yes, the dark color in a dark room has happened in our house. We have a couple of “dark” rooms in our house. When the walls were white, nothing really stood out. But with the walls painted, the color catches your eye and then you start noticing everything else in the room. I love white as well. I’m trying to decide if I want to go darker/lighter with my paint because my new room has less light than my current room.That’s an interesting thought about darker colors for a darker room- I always thought the opposite, but I can see how darker rooms with light colors could appear cold. Yes, the dark room with dark color has happened in our house. We have a couple of “dark” rooms that used to have white walls. They were just…blah! Now, with the color, it catches your eye and then you start noticing everything else in the room. I love white rooms. But I have found that they are very cold looking in the winter and since we have winter for six months of the year here, it’s impractical. I also love dark rooms, because it makes the rooms feel like a cozy little nest. My problem is that I love everything! Oh, dear. Despite my vow to stop BUYING books + just check them out at the library, this beauty might be worth springing for. Man, do I really want to hang plates — and lots of ’em — in our kitchen re-do! TY for the heads up! 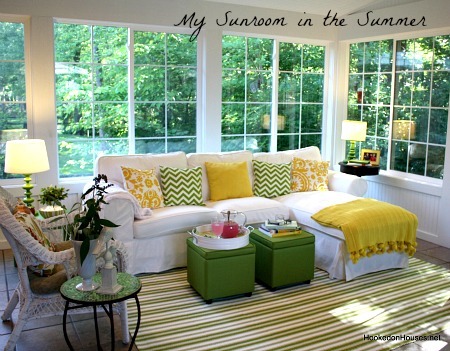 I love white rooms, but I like them with pops of color, like your sunroom. I saw that book at the bookstore last week, but I got distracted and didn’t buy it. Earlier this year I went from dark pine to white built-ins for my LR and just love the change. The room appears much larger and any colour coordinates. I wouldn’t go back to the pub look for anything. White makes happy. I don’t have any white rooms in my house, but I love oohing and aahing over them in decorating books! I love your white sunroom and I love white rooms in theory, but they just aren’t for me. I totally agree on the ceiling beams part. Would love to see pictures–sounds beautiful! I’ve never been a white room person – always reminded me of my college apartments where I was not allowed to paint the walls. But after selling my house and moving into an old country farmhouse rental, I’m warming to the white plaster walls with original wood trim. The light in the house is fantastic, and I think that’s the key. An all white room during the summertime is absoulte design perfection!! I like white (or cream) but am surrounded by maples in back and side yards. I have found some color offsets the gray effect all the shade gives me. An article about choosing color made the point that white needs light to look right. Color deepens with less light. White grays. I do love the book too, inspiration….. I am not a “white room” fan. I love colour. Colour to me is emotion and individuality. I appreciate the décor of a white room but I love walls with colour (even a hint) and I love how a simple change of colour can freshen a space and make it renewed. What a cool cover! I love white…but it does have to have some contrast to warm it up for me – like your lovely sunroom and that gorgeous room they pictured with the wicker sectional and wood ceiling. But in the summer, I am always having to stop myself from painting all of our nice wood trim bright white. it is a MAJOR temptation every year! As far as decorating books go, I have lately read Stephen Saint Onge’s book No Place Like Home. (and did several posts on my blog on him! :)) I am going to have to look for the Country Living book in the bookstore. A white kitchen …must be a nightmare to keep clean !!! I have the same situation as we are surrounded by trees and my house is always dark. I really love light green walls but feel like I need a lot of blue with the trees surrounding us. White is pretty when you have a lot of natural light but I always prefer color on the walls. If you can’t afford anything but a can of paint, a beautiful color transforms the room. This cottage photo has been around awhile – ever since it was featured in the New York Times a few years ago. But it’s still fabulous and one of my all-time favorite examples of white decor. I love for a room to have a light, yet warm feel. Some of the all white rooms I see now look very sterile. Your sunroom is a great balance of white with pops of color. Every time I see an all white room I want to add a red pillow or a bold cobalt vase. I love white rooms and I always have. Every since I watched an Elvis Presley movie and there was a character in the movie who had an all white room . In real life though it’s hard to pull off when you have kids and dogs. I do have a lot of white in my house but with pops of color. 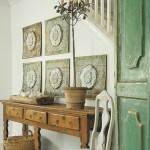 When I am dreaming of white rooms, I go to Thistlewood farms.com to look the white rooms in the farmhouse. I might just buy this book about white rooms. I’ve followed the progress of your sunroom since the beginning. I love the white beadboard with simple trim and patterned my screen porch after it. It’s taken me 2 years to build by myself (with a little roof & heavy lifting help) but I hope to pass the final inspection this week. Thank you for the inspiration! I decorate with a lot of white and I love it. I’ve tried dark colors in this house and it just doesn’t work. It just feels better this way. My son asked me a while back why our house is “pitch white.” Lol, he was 6 at the time. It’s not all white though because we have dark floors and a bit of color on the wall despite the white wainscoting. I love all white rooms though with different shades of white and lots of texture. We have a shaded lot, too, and I’ve found the same thing with dark paint. They (whoever they are) always say dark paint makes a room feel smaller. We painted our dining room a matte dark colonial blue, and with the white trim providing contrast it feels intimate but not claustrophobic. I think having high contrast accessories, like your yellow lamps, helps keep it interesting. Just ordered the Decorating with White book. Thanks Julia! The thing I noticed is that the room is only white where it’s painted and furnished. A lot of that surface area is natural wood which really warms it up and makes it interesting. I loved it. Hmmm, makes me wonder if I’m going too light on the paint color for our dining room/kitchen, given we are in the woods. Maybe that’s why the previous owners chose a dusky white. Nah, I think it was just 1990 and that was popular (and yes, the paint has really held up…but now it’s gotta go). You’re so right. I love white. I like white walls that are an intentional component of a room’s design. Not the unimaginative ‘builder’s white’, or the walls I had to deal with in the apartments I lived in during my 20’s. I think what makes those photos shown from the book so appealing is the texture of the materials, with a mix of painted wood and wood left in a stained, worn, or natural finish. I love the contrast of old wood with white, but few of us live in houses with wood walls and ceilings (like barns or old rural cottages), as well as floors, like the ones shown here. White sheetrock walls and ceilings just don’t have the same effect – they lack the texture. My 1920’s house has stained woodwork on the main level (except for the kitchen which is all white), and a stark grayish white looks wrong. I have all the plaster walls in a warm creamy white, and it’s a nice contrast with the dark wood floors and woodwork. We have a lot of shade trees, too, and it still can be dark. At the cabin we have rough-hewn log walls and it would be wrong to paint or whitewash them, but I am intrigued by the first picture with everything white mixed with the pine walls (however, all our ceilings and trim are honey pine, too). But I think I love color and prints too much to go with this look, as much as I love these pictures. I will enjoy drooling over this book, nonetheless. I really love that bedroom. The dark floors, ceiling beams and the trunk against the white are so elegant. I love white rooms and also those with color. White walls and little natural light causes too many shadows which is definitely not appealing. What looks great in magazines is not necessarily going to work in a space, so I decided to treat each room accordingly and to our northern temperatures. I love all those rooms. The teal wall is very inviting. 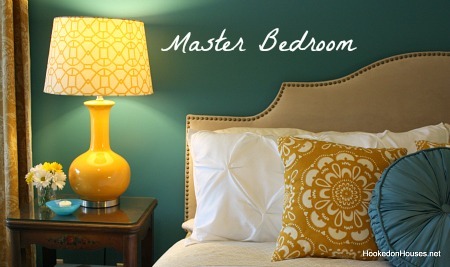 My bedroom was initially painted the typical painters’ beige and facing north it was blah. I find that adding a darker color in a basic 4 wall room does add a little drama, like my powder room. The white look is beautiful in photographs, but what is it like to live with it? In the books and mags, someone is always saying, “Oh, white slipcovers are so easy! Just throw them in the wash!” It might be easy if you have two sets of white slipcovers and a staff to wash them for you. (And a staff to wipe down all your white painted wood.) On the days when I wash our slipcovers, the whole house is disrupted and twenty minutes after I put a freshly-washed slipcover back on the couch, someone is guaranteed to spill chocolate pudding on it. Textured white walls are lovely. Of all the white rooms that you’ve shown here, I like the one that follows the pic of your bedroom. The contrast makes it work with the natural wood ceilings. If there were not different textures it would feel bland. I rented for a long time and was never allowed to paint, so I got sick of white. As soon as we moved into our current home we started painting. The walls in my living room are more of a green shade of white. My kitchen was white after we striped off all of the wallpaper and until we were able to renovate. Now it’s a warm shade of white that compliments the wood cabinets. I also have a white bathroom, which I felt would help to make the small space feel larger, but I must admit that it is a pain to keep clean. I also agree that white can feel really cold. I live in a smaller home so I used lighter colors as I always thought it would help to open up the spaces and infuse it with light–not that bright sunlight is an issue where I live. One thing is for certain, I’ll never get a light colored rug EVER! As for the rest of the house, I’ve experimented too and enjoy using more color and contrast. 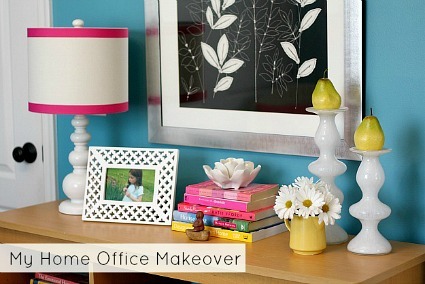 I feel more drawn to color when I look at decorating blogs and magazines. I bought Victoria’s chair from Ballard Designs. Mine reclines but you can’t tell it does by looking at it. The fabric is identical!